A great-sounding Waldorf VA engine, decent FX, user samples and wavetables. Don't overlook it! Though it's lightweight, it's well put together and stands out on stage. The Waldorf designed sound engine sounds rich, full and suitably analogue-like. The new user sample capability vastly expands its appeal and sound palette. 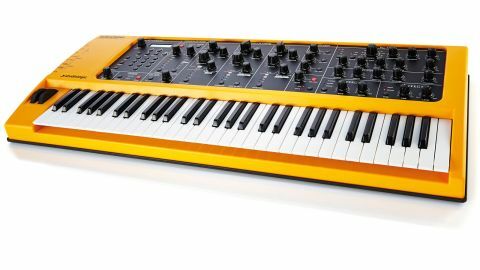 The original Waldorf-engined Sledge launched in 2012 and, despite being pretty reasonably priced and offering a very solid synth engine, it has largely fallen under the radar. However, v2.0 will get people taking it a lot more seriously. The Sledge is big, yellow, plastic and adorned with 32 large knobs ready for tweaking the onboard sounds. All the knobs also transmit and receive MIDI, so it makes a great controller for plug-ins and other MIDI gear. It's pretty imposing size-wise and quite deep from back to front. Build quality is good despite this being a lightweight board (you can pick it up under one arm) and the knobs and switches feel pretty solid. "It's a great choice of front panel design as it's tried and tested and very familiar to most people and it flows very nicely"
There's a simple two-line blue backlit display for displaying deeper functionality (though reliance on the screen is minimal which keeps this board nicely performance-oriented) and there's a numeric keypad for direct program access to the 1,000 user-rewritable program slots onboard. The keyboard feels good under the fingers and, whilst it's not got the super-fast high-end feel of a Moog Voyager (for example), it doesn't feel cheap either. It also features that rare beast called aftertouch, which is often missing from even more expensive boards these days! Basically, whatever you have assigned to the mod wheel is what is triggered when you use aftertouch. It would be nice to be able to send the mod wheel and aftertouch to separate destinations (next OS update perhaps?). There's no doubt that the Sledge's front panel has been largely influenced by the Minimoog with its classic three oscillator + filter + dual envelope layout. It's a great choice of front panel design as it's tried and tested and very familiar to most people and it flows very nicely. It's certainly inspiring to tweak and addictive too, and the oversized dials make you feel like you're firmly in control of a futuristic musical spaceship! Above all, the Sledge is intuitive with almost zero learning curve so both beginners and seasoned programmers will appreciate it. Moving on to the sound engine, this has been co-designed with Waldorf and we really dig the overall sound and character. It sounds less industrial compared to its Blofeld cousin with more general ballsiness and the overall vibe can be best described as warm and full with a defined edge and a nicely analogue texture. The Sledge excels at bright, brassy patches, low filtered pads, warm mono leads and snappy bass sounds (courtesy of the fast envelopes); though, with 66 PPG wavetables onboard (and now user samples too), it's capable of a wide range of new and more otherworldly textures not previously available on the original Sledge OS. "It excels at bright, brassy patches, low filtered pads, warm mono leads and snappy bass sounds"
Of the three VA oscillators, Oscillator 1 is the most interesting as, in addition to the standard sine, triangle, square, saw and variable pulse waves (these are available on all three oscs), you'll also find the aforementioned 66 wavetables including types such as Karplus Strong (for emulating plucked/percussive/ hammered sounds), plus organs, formants, sweeps and more (note: user samples are also selected via Osc 1). However, the Sledge's big ace card is that you still have a further two oscillators available to layer along with samples or the wavetables and there's now 24-note polyphony which is especially handy when building more complex poly-patches/layers. Modulation-wise there are three mod busses (two LFOs and one for the mod wheel) with speed and depth controls, each with six waveshapes and six destinations including wave/FM and PWM, plus an arpeggiator. The sine/triangle waves of Osc 2 can also be FM'd by Osc 1, whilst the sine/triangle waves of Osc 3 can be FM'd by Osc 2. It's surprisingly easy to create DX-esque basses, pianos and strings, plus there's oscillator sync, mono/poly modes with single/multiple triggering and polyphonic glide, although monophonic glide only triggers when playing legato. The Sledge also offers up a versatile multimode filter featuring LP, BP and HP modes with 12dB/24dB slopes and the filter types sound authentic to classic analogue designs - the cutoff has a wide range, opening brightly in the tops for cutting leads and Oberheim-style brass patches but things can go nicely deep andpowerfulin the lows for Moog-stylebasses and huge subs. The resonance sounds powerful and liquidy (watch your speakers!) and the filter self-oscillates too, so you can use the resonance for creating authentic analogue kicks and more. The drive feature sounds a little brittle but it dirties things nicely at lower levels whilst there's also pink and white noise for making FX and drums. Finally, there's a great chorus/phaser/ flanger and separate/simultaneous (and very usable) reverb and delay units, (though we hope Studiologic can address the clicking through the audio path when selecting different effects). To conclude, we've always liked the Sledge's sound but things just got a whole lot better with v2.0. The fact that you can now use delay and reverb together, coupled with PPG wavetables, aftertouch, samples, FM, 24-note poly, splits/layering, all at an RRP of £799, makes Sledge v2.0 a real steal!